Materials: Black painted aluminium, metal part. Rubber hose. 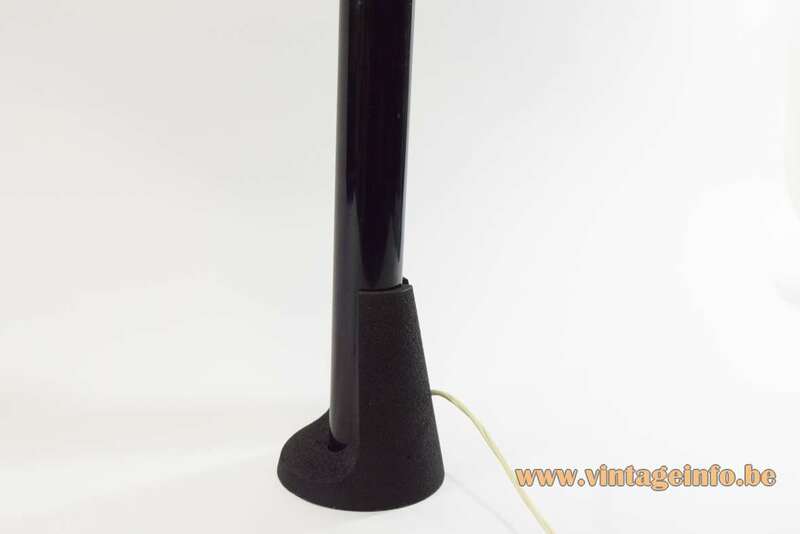 Cast iron base, painted with wrinkle paint. 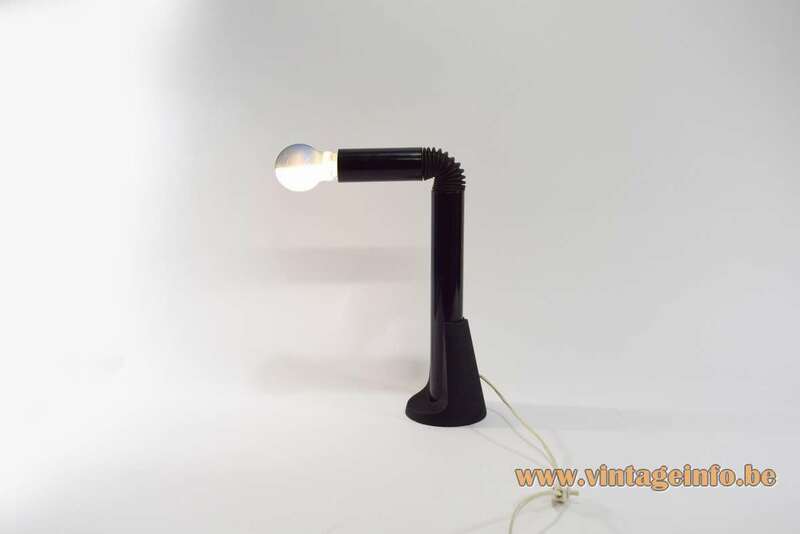 Any type of light bulb can be used, but a Cornalux bulb is prefered. Designers: Danilo & Corrado Aroldi in 1967. 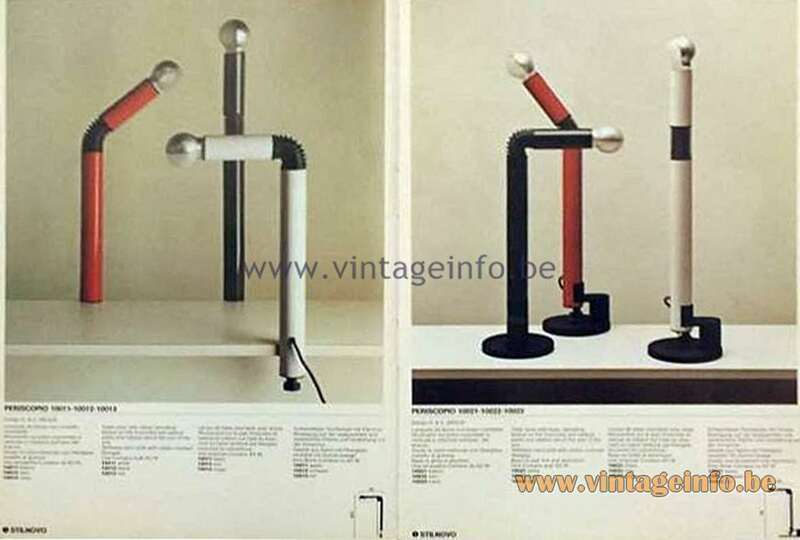 Other versions: Made in many variations and colours: several table lamps, a clamp lamp and a floor lamp. They were produced for many years. Today new editions are in production. Danilo Aroldi (1925-1988) was born in Casalmaggiore, in between Milan and Bologna in the north of Italy. The town is famous for its international music festival. In 1936, after leaving his hometown, Danilo Aroldi moved with his family to Milan where he attended the Liceo Classico Statale Giosuè Carducci (Giosuè Carducci State Classical High School) and later the Accademia di Brera, also in Milan. At the academy he meets the masters Aldo Carpi, Carlo Carrà and Achille Funi. His classmates were Dario Fo, Amilcare Rambelli and Gianni Dova. Together with his brother Corrado he founded the studio Danilo e Corrado Aroldi – Architettura e Industrial Design in the early 1960s. For Stilnovo the studio designed also the Spicchio lamp series. They also designed lamps for Luci. Their designs are now included in the permanent collections of the MoMA in New York and the Triennale di Milano, or selected for the Compasso d’Oro. At the beginning of the eighties Danilo rejoined the painting. Between 1983 and 1988 he made a corpus of about three hundred works, deeply coherent and characterized by constant research. Danilo Aroldi died in Milan in 1988. Corrado Aroldi was born in 1936. He is the younger brother of Danilo. He works in Milan in architecture and industrial design. His works were selected for the Compasso d’Oro in 1979 and 1991. His works have been shown in design exhibits around the world. He has been jury member at national and international design competitions. Also board member of the ADI (Associazione per il Disegno Industriale – Association for Industrial Design) from 1985 to 1988. 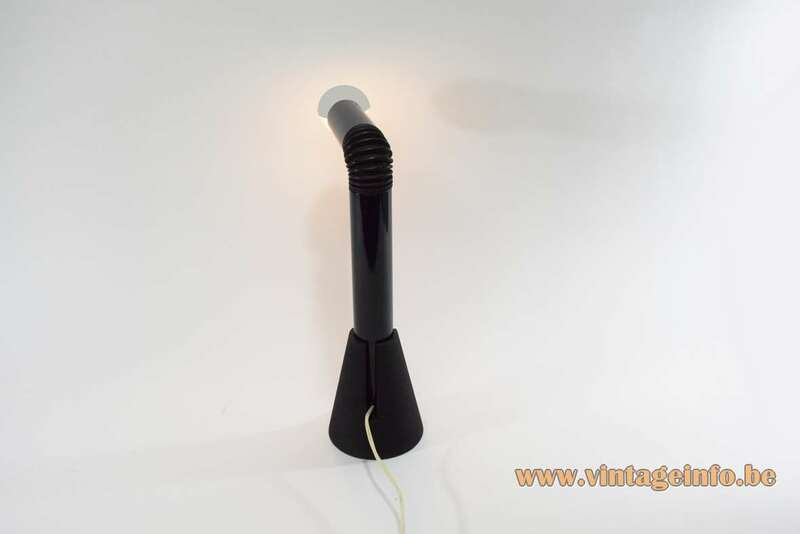 All the electric parts are made by the VLM Components company from Buccinasco, near Milan. 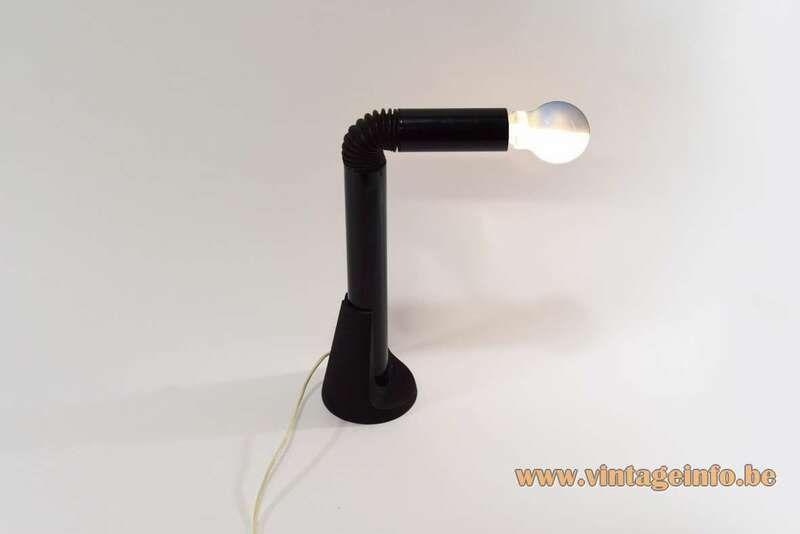 The Cornalux/Hammerhead light bulb was designed for the Tito Agnoli lamp model 387 in 1954, made by Oluce. 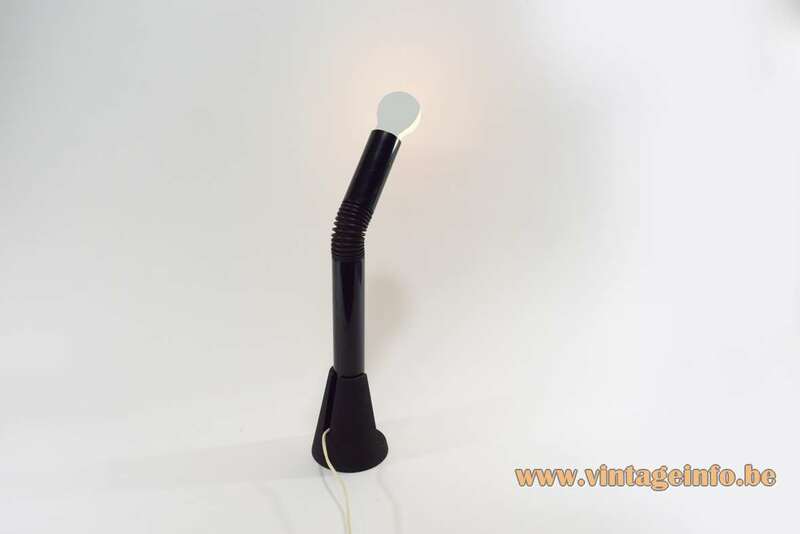 Joe Colombo re-used it for his Spider lamp series in 1965. These light bulbs are still available online. An alternative was also created by Oluce. 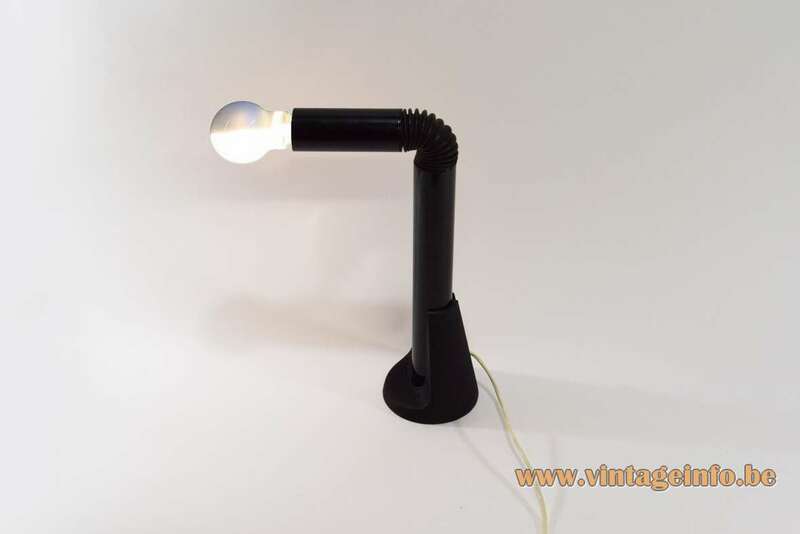 Founded in 1945, Oluce is the oldest Italian design company in the illumination sector still in operation today. Many thanks to Christophe for lending the lamp.